Philips Fidelio SoundSphere DS9800 review | What Hi-Fi? And now for something completely different. 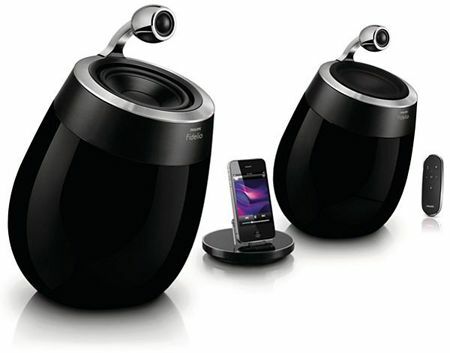 The Philips Fidelio SoundSphere DS9800 powered speakers are a distinctive, AirPlay-enabled alternative to a boring old iPod dock – and you wouldn’t mistake them for the powered MP3-friendly speakers from the likes of Epoz or Audioengine either. If you want a pair of speakers that look like nothing else, get in line. Despite their complex shape, the speaker enclosures are crafted from wood – they’re then given seven coats of lacquer for a deep, glossy and fingerprint-unfriendly finish. In the mouth of each cabinet sits a 13cm mid/bass driver that fires forwards and upwards; a 25mm, soft-dome tweeter sits above, isolated in its own aluminium arm. The tweeter housing looks temptingly like a handle. It isn’t. The left-hand, powered speaker incorporates two 50W class-D channels of amplification, a 3.5mm analogue input and the infrared remote control receiver. The right-hand speaker is slaved to the left via a generous length of bundled cable; there’s also an iPod/iPad dock in the packaging so you can charge your player while it’s playing. The Philips Fidelio control app is nicer to use than the little remote, but not by much. Connected to our iPad via AirPlay and playing a 1411kbps file of OutKast’s Hey Ya!, the DS9800s deliver a compact, defined soundstage with a nicely balanced, neutral tonality. Integration is good, and even though the finest details go missing the DS9800s are engaging. Low frequencies are deep and controlled, the midrange is informative and there’s benign sparkle at the top end. There’s ample dynamics when the going gets boisterous, and more than enough drive to propel songs in fine style. Oddly, their character changes a lot when they’re connected via the line-level input. The soundstage opens up, but at the expense of integration – and the tweeters become ill-deservedly confident, with a suddenly brash and forward voice. We’d stick to AirPlay – that’s when the drama of the Philips’ looks is very nearly matched by the quality of their sound.